A recent survey by Gartner shows that the right technologies break the barrier and enhances the growth of the real estate businesses by 36%. This means thousands of companies are not using the right tools for their businesses. Ultimately, the most significant setback faced by any department the most is the maintenance team, resulting in fewer task completion each day. ERP software equipped with mobile maintenance tools boosts the speed and efficiency keeping technicians updated and moving towards the next job in place of wasting time in running back to the office from time and again for further instructions. To get the work done faster and better, user-friendly display plays the most crucial role. 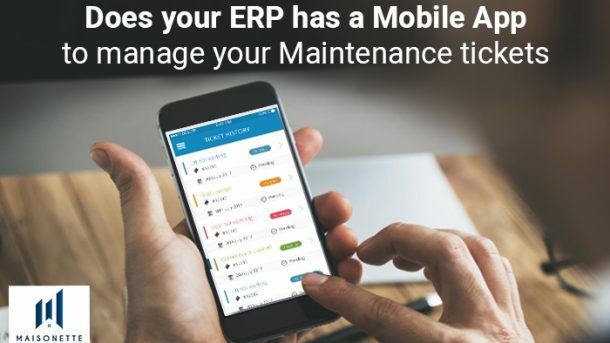 Here, we went through five major roles played by the mobile app for ERP in managing the maintenance tickets and simplifying the work. In present highly competitive world, where customers have more options than ever before, it is vital to integrate the customer’s insights in everything we do and treat them as partners; then only a loyal customer base can be built. Hence it is essential for the service providers to be prompt and offer accurate information while employing empowered and knowledgeable employees. Through a mobile app, technicians can quickly view all the open and newly issued tickets and immediately get to work in resolving them in place of running to the office for every single update. A mobile app is easy to carry and communicate through in comparison to any desktop or laptop. A ticket raised by the tenant without any time lapse reaches the real estate manager and technician through the app who can immediately focus on resolving the ticket without any further delay. The mobile app enhances the quality of administration while reducing the lead time from job scheduled to job accepted and from job completion to billing. With Maisonette Mobile App Solution, end users can easily access the information and report the quality of the customer service without any hassle. Mobile apps offer the anywhere connectivity at any time. The moment tenant raises a service request, immediately the real estate manager gets the notification of the same, and a technician present in the area receives the work assigned. Since the entire service operates in real time, hence no time lapse occurs in between the job scheduling and job acceptance and neither when the job is performed or for the billing. With a simple design and layout, it’s almost impossible for the tenants to get intrigued while ticket generation. Most maintenance apps are complicated to use forcing the user either to search for solutions on the internet or move to some other service provider. But Maisonnette ERP software focuses on the comfort of the user. The tickets are answered promptly and accurately. The swift navigation helps the tenants in raising a ticket while the maintenance team immediately sets to work on resolving the ticket. The added benefit of the mobile app is it’s available 24/7; a customer can raise the ticket irrespective of the time. The mobile apps keep getting updated with the passage of time offering the best features to the customer. The user no longer needs to manually sync the data as the changes automatically get updated and synchronized in a mobile app. When new work orders come in, the real estate managers can attach relevant files and images for the technicians to perform the task with perfection. The benefits of the Mobile app is self-evident. For all stakeholders (owners, occupants, managers, etc.) will surely profit financially, while the bonds among all will strengthen with time. Be the first to embrace the transformation by making Maisonette your partner on the journey to success and profit. The ever-growing Real Estate industry is filled with rigorous demands and complexities making the work of real estate companies difficult. We, at Maisonette, have designed and developed a software package to withstand these demands and surpass the customer expectation.